Ho Ho Ho! Wait! No. I shouldn’t be doing this. I am not Santa Claus. I am God. I should be more serious and sober. Let there be light. Now does this sound better? Go forth and take my word across the seas and spread my message to all the heartens. What nonsense is all this? All this sounds so pretentious. All you humans spread crazy rumors about me and attribute all kinds of weird things to me. And I can’t even go down and clear the air. For if I do that I would have created undeniable proof of my existence. That would be the beginning of the end. As long as there is doubt of my existence you would hedge your bets by trying to get things done on your own while praying to me on the sidelines. But the moment you know for sure that I am out there looking out for you, you will give up all initiative and line up at my door with your begging bowls. As it is I am sick of all the sycophancy and self-abasement. Anyways if I get started about humans, I can keep ranting for eons. Instead let us talk about more interesting beings – frogs. What about frogs now? I created them for one. And I had attempted to give them intelligence. Frogs and intelligence? Yes. Not the ones you see now. Those were the days before I created you humans. Now don’t give me those incredulous looks! I know all that stuff that goes around about me creating the entire world in six days and six nights and taking rest and all that. But come on! Think logically. How can someone get it right in the first attempt? Now. Now. Don’t flatter yourself. I am not saying I got it perfectly right even now. But at least I did a better job than I would have without all those attempts with intelligent animals, men of wood, men of mud and all those. So coming back to the point, this is about those intelligent frogs. Strange are the ways of intelligence. As it is now with men, it was with the frogs back then. I gave them everything. I gave them plenty of fresh clean water to play around in, lot of flies to feed on and enrich themselves, no threats whatsoever to endanger their lives. In short I had created a paradise on earth for them similar to the one for humans you talk about in your holy book - the place where this chappie Adam was supposed to have lived in along with his girl Eve singing kumbaya under apple trees till the day a snake came along. But along with all these gifts I gave them intelligence. And that kept eating through their insides and they wanted something more. They started praying ardently to me. Initially I tried to ignore the prayers. But they persisted and it began to get very irritating. These prayers float right up to heaven and keep buzzing like annoying flies. Eventually I have to grant a boon to whoever it that is sending them up to get rid of them so that I can recline in peace and contemplate about my own glories. Now don’t ask me how they prostrated themselves in their dream and all. I don’t want to get into metaphysical discussions about reality and dreams now. Do you see what is happening? Does this all sound all too familiar? Despite all my attempts, this fatal desire to be lead was the part I could not completely weed out. So you humans too suffer from the same affliction. But then you do have free thinkers who are free of this. Maybe I should study them and use the findings in my next round of creation. But you, my dear friends are stuck with it. “Hard luck, guys,” is all I can say. So I decided they had made up their mind so firmly that even their creator could not change it. So I decided to humor them. The next morning when they woke up, a huge log dropped in the middle of their lake with a huge splash. It was not just a plain log – it was a painted one with a facial features and stuff - you know like those effigies that some of you folks in the South Americas made. I was left in peace for some time. But not for long. Once again the buzzing started. The frogs were at their prayers again. Damn it! I mean come on. I am God. I can say ‘damn’ Technically I can’t indulge in blasphemy you see. It would lead to some kind of paradox that would disrupt the space time continuum and stuff like that. Again, I tried to ignore. But I had indulged them once. So they were not going to spare me till I indulged them again. Now do you see why I am so reluctant to answer your prayers? I once again appeared in their dreams and delivered my usual opening address. This time I added a bit more fire in my speech. Threatened them with hell fire, damnation and all that. It was fun seeing them quake with fear. But they were back with new demands and complaints in their obsequious tone. Again, the whining! If I had my way, I would make whining the eighth sin. I knew just the king they needed. I had held back from sending them that one. But now after they had stated what they wanted in so clear terms, it had to be done. So I let loose the king stork. No intelligent bird was this stork. But it knew it’s job. And went about it with clinical precision from day one. A diligent worker it was that stayed awake eighteen hours a day to carry out its responsibilities. It went after the weakest frogs to weed out the weaklings to make the frog race strong. Then it went after the disruptive and rebellious elements to keep the frogs united and strong as a tribe. Then when they were none left, it went after whoever were significantly different from the rest to bring about the purity of race. By now the buzzing had started again. 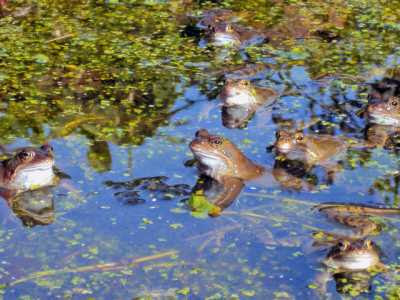 But the thing was this time the clamor did not grow as the increase in prayers matched the decline in frog population. And soon there came a time when the decline overtook the growth and from then on the buzzing began to drop till one day the buzzing stopped completely. That was the end of the race of intelligent frogs. I created frogs again. But this time it was those dumb frogs that you see now. And they have lived and flourished and continue to do so. Seems like with intelligence, the self-destructive streak also gets eliminated. But I have given the intelligence to you humans now and I can sense a kind of déjà vu feeling about this whole thing. Anyways I wait and watch. Ironies of life have a surreal beauty to them and it is one of the joys of creation I savor.